How to change the color of menu text? I managed to change the selection color from orange to light gray which is very nice. 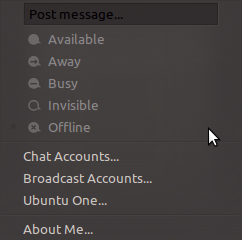 Now I'd like to change the text color of inactive/disabled menu items which are in black as you can see "Available" "Away" and "Busy", the text is black. I'd like it to be gray for example. How to change the color of that text? To change that property, you'll need to hack the gtkrc file for the theme in question. I presume that you're working with Ambiance. You also need to edit the index.theme to use your new theme. You should have Ambiance-Mod in your "Apperience Preferences." Now let's edit the gtkrc file. The the part that controls the text you'd like to change can be found on line 334, fg[INSENSITIVE] for style "menu" = "dark"
You need to change shade (0.54, "#43423f") to use your desired Hex color. Try something like "#969696" Make sure it is quoted. If you'd like to play around with more options, check out the GTK Theming Tutorial on the GNOME wiki. Not the answer you're looking for? Browse other questions tagged 10.10 menu themes colors text or ask your own question. How can I change the text colour on my desktop icons? How do I change this theme's menu behavior back to 12.04's behavior?